Easily the best film containing a storyline about golf that I have ever seen, writer/directorRon Shelton's under-appreciated Tin Cup (1996) is worth a viewing, even for non-golf fans, during The Masters' tournament weekend especially. Much like Shelton''s other classic sports-related comedy/dramas from the late-1980s and early-1990s, he has an excellent reputation for not only celebrating sports in his films, but also fusing real human stories and relationships (other examples include Bull Durham (1988) and White Men Can't Jump (1992)). In this film, just as in Bull Durham, Kevin Costner steals the show as an edge but likable rugged athlete. An unreachable shot to the green. A hopeless romance. 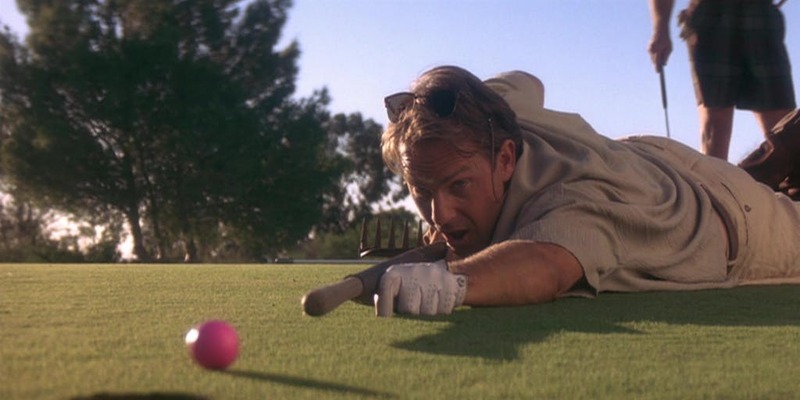 Driving-range pro Roy McAvoy (Costner) can't resist an impossible challenge. Each is what he calls a defining moment. You define it. Or it defines you. With lady-killer charm and a game that can make par with garden tools, Costner rejoins Bull Durham filmmaker Ron Shelton for another funny tale of the games people play. For Costner's Roy, golf is a head-and heart-game. On both counts, that's where shrink Molly Griswold (Rene Russo) comes in. She's big city, Roy's small time, and he believes only the grandest of gestures can lure her away from a slick touring pro (Don Johnson) and earn her love. So Roy and his dutiful caddy (Cheech Marin) set out to do the impossible: win the U.S. Open. With laughs, clever battle-of-the-sexes banter and a handy way with a 7-iron, Tin Cup winningly defines the moment and contemporary romantic comedy.